What’s not to like about Spring Break? It’s a much needed respite from school; the beginning of a fresh, new season; and an opportunity to spend lots of time together as a family. And there’s the rub. Sometimes it doesn’t take long for lots of time to turn into too much time. Teens can be irritable, inflexible, moody, and unreasonable in their expectations. 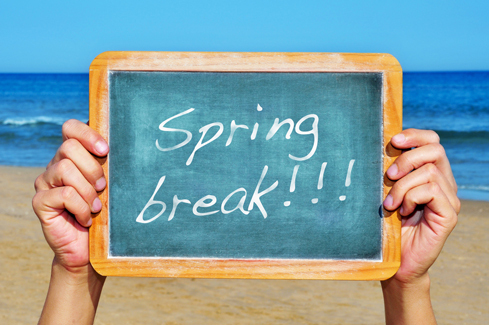 Seven full days of these emotions can stretch the patience of even the most saintly parents, so here are seven tips to get you through Spring Break with a smile on your face. Expect your kids to sleep in; keep the schedule flexible. Most teens sleep longer than we do, and this isn’t due to laziness. According to the National Sleep Foundation, teens need 8.5 to 10 hours of sleep per night to function best, a little more than the adult recommendation of 7 to 9 hours. Just as we like to catch up on our sleep during vacation, teens do too, especially if they are highly academically motivated or involved in sports and activities that consume most of their days. You may be impatient waiting for them to start their day, but allowing them to wake at their leisure will make for better attitudes and more appreciative teens who are more likely to go along with your plans. Remember that it’s the little things that make memories. My son is 23 years old now, but he still talks about that one time in high school when we played miniature golf. Why? Because the winner got to choose any dessert he wanted as a prize, and his competitive nature brought him that win, and, as I recall, a tub of Snickers ice cream. Our family has taken major trips and spent a lot of money on activities, but this putt-putt adventure cost about 20 bucks, and it’s a day he remembers fondly. Sometimes the most priceless packages are wrapped in the smallest boxes. Proceed with caution when it comes to teen Spring Break trips. I understand that teens want to travel and “escape the real world” for just a bit, but if it’s financially feasible, I urge you to do this as a family, versus sending them off with other teens. High schoolers are still quite naïve to the ways of the world and even the best of them can find themselves in uncomfortable or unsafe situations when they are away from home without adult supervision. While the vast majority of hotels will not rent to children under 18 without at least one adult present, remember that many teens have slightly older brothers and sisters who would qualify for this age limit. High school kids staying with college-age kids at a Spring Break destination can be a recipe for disaster, and I encourage you to avoid this. Let your kids enjoy balanced, unhurried days. Educators and child psychologists are seeing more stressed-out kids than ever before, so it’s important that kids have this chance to relax and do what they love to do. Give them a chance to sit around in their PJs and surf the net, but also try to plan a unique activity into each day that gives them something to look forward to. This can be anything from a movie to an evening at an arcade to visiting family across the miles. The key is to get them out of the house and moving, even if it’s only for a couple hours each day. Make your home a comfortable place to be, for both them and their friends. Encourage your kids to invite their friends to the house, and always let these friends know that you like them and they are welcome. My daughter and her friends spent hours in our kitchen baking and talking, then sharing their sweets with the family. Our son and his friends spent entire evenings around the fire pit in the backyard, just shooting the breeze, playing guitar, and laughing. I always knew who my kids’ friends were, and I always knew what they were doing. There’s definitely something to be said for being the host house. It may cost you in groceries, but the trade-off is well worth it. Find one go-to activity that your family enjoys doing together. Never underestimate the power of tradition. It creates comfort, familiarity and cohesiveness within a family. Kids may never say it, but every time you come together to resume a task, continue a game, or recreate a memory, you solidify the family bond. For some families, it’s working a 1,000-piece puzzle. For others, it’s playing pool, cards, or a board game. For some, it’s Wednesday Sandwich Night or breakfast for dinner. There’s nothing more beautiful than turning a fun family activity into a treasured tradition. During Spring Break, no matter where you are or what you’re doing, spend time resurrecting special moments. 7. Take some time to remind your kids to finish the school year strong. This is a tough stretch for kids. They get a taste of summer freedom this week, but tired as they are of school, they must return for a few final months. Encourage your kids to use these break days to rejuvenate and refresh so they can do their best work during this end-of-year push. Kids should be prepping for final exams, AP exams, and for some, SAT and ACT, so a little parental encouragement is crucial at this time. No matter what you decide to do with your kids, know that just spending time together is the absolute best goal to have. Here’s to a relaxing and peaceful Spring Break 2016! For more ideas about bringing your family closer together, check out Teenagers 101.